It won't be hard to find the perfect place to kick up your feet and rest your head in-and-around the Mobile Bay area. We have more than 6,000 rooms to fit every taste and budget available. 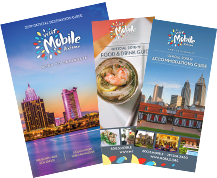 From four diamond hotels that cater to your every need, to historic inns and bed & breakfasts, to value-based, limited-service properties, you'll find great deals and genuine Southern hospitality around every corner. Our hotel partners are true ambassadors for this area and are ready to assist you in planning a memorable visit - their genuine hospitality for your well-being permeates through everything that they do. For ten rooms or more, please visit our Conventions or Group Travel sections of this website to connect with a sales manager - we'll be happy to help you contact hotels for group rates!